Railfreight operator Lokomotion has ordered 8 Vectron MS locomotives from Siemens. The locomotives will be configurated for operations in Germany, Austria and Italy, will have ETCS on board and have a maximum speed of 200 km/h. Delivery is scheduled for the Spring of 2017. With this order, Siemens has reached the mark of 20 customers and 300 sold Vectron locomotives. It is one of the eye-catchers of this moment; Lokomotion locomotive 193 773 and its new ‘Brennereisenbahn’ livery. Four more beautiful portraits are on Railcolornews.com thanks to Franz Fanger and Christian Bauer. Andreas Kepplinger caught the 773 last Friday with his camera in a total new design. 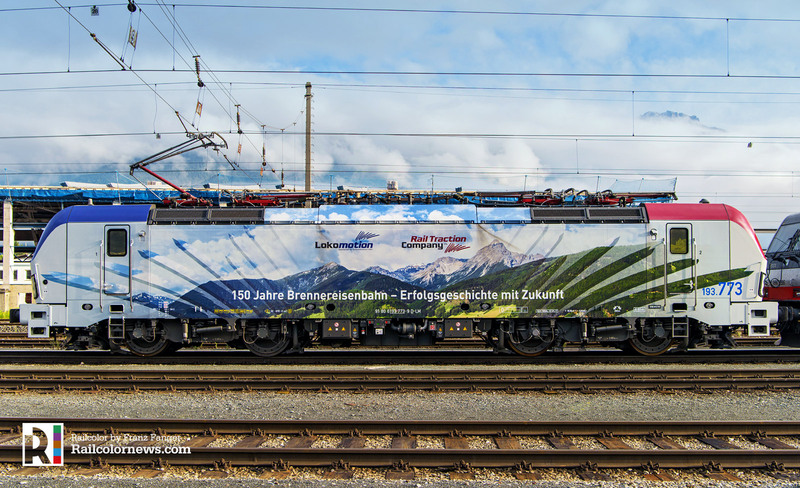 One cab in red, one in blue and its side now have stickers celebrating the 150th birthday of the ‘Brennereisenbahn’ (or ‘Brenner railway’ connecting Innsbruck (AT) to Verona (IT)). Do you like it? Larger picture here. Lokomotion just got new stickers: numbers all around and logos upfront. But what about that single blue stripe? Work in progress? 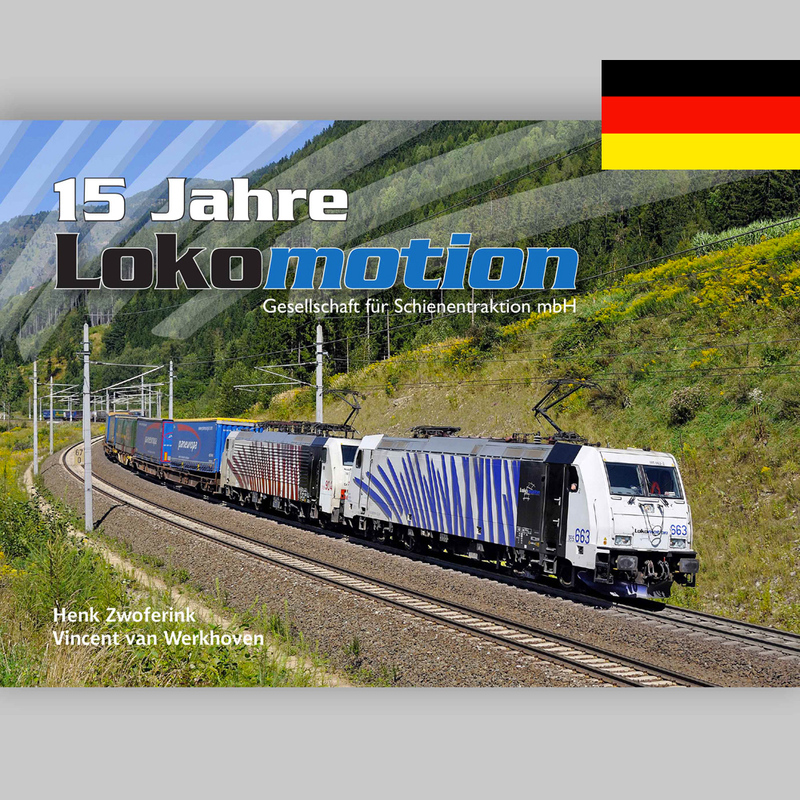 Lokomotion's first Vectron is hot: today 'Viola' pulled a TEE train, several photographers were able to catch it. Thank you for sharing with us! Udate: We have a new image made by Andreas Kepplinger from Kufstein. Its shows Lokomotion 193 772 in the night. New is her name: Viola. Background: Rail freight operator Lokomotion ordered 8 Vectron MS locomotives from Siemens in February 2016. The locomotives will be equipped for operations in Germany, Austria and Italy, will have ETCS on board and have a maximum speed of 200 km/h. Lokomotion wants to use the number 193 770-777 for its new machines, so the ‘triple 7’ is within the range. Lokomotion already has a (186) 444 and (185) 666. Wichtig: Das Buch ist in deutscher Sprache. Rail freight operator Lokomotion has ordered 8 Vectron MS locomotives from Siemens. The locomotives will be configurated for operations in Germany, Austria and Italy, will have ETCS on board and have a maximum speed of 200 km/h. Delivery is scheduled for the Spring of 2017. With this order, Siemens has reached the mark of 20 customers and 300 sold Vectron locomotives.